New Zealand Mint is pleased to introduce the third coin in this popular collection, the Warriors of History-Spartans 1 oz Silver Coin. This coin collection brings alive the stories of some of the most legendary warriors in history. You can now buy the pure 1 oz Warriors of History-Spartans Silver Coin on our online store! The Spartans coin reverse shows a colored illustration of a heavily armed Spartan soldier. He stands against an engraved background featuring his army approaching a battle. This high impact partly-engraved 1 oz silver coin comes presented in a sleek and stylish themed rectangular coin case, with textured cover. The uniquely numbered Certificate of Authenticity sits inside the coin case. With a limited mintage of 5,000 coins, this Warriors of History-Spartans 1 oz Silver Coin would make an excellent gift for coin collectors and those interested in history. 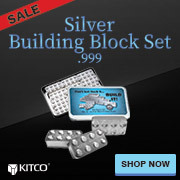 Buy your Spartans 1 oz Silver Coin from Kitco today!